Sarah Albritton submitted this photo and caption. I am a student percussionist from Alabama, and a huge DCI fan since I saw my first show two summers ago in Troy. 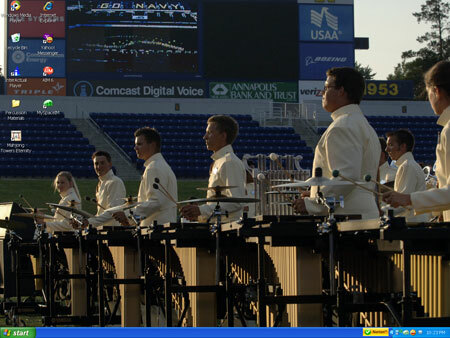 Lately, I've taken an interest in Carolina Crown – particularly the front ensemble section. This is a screenshot of my computer desktop. I made it this way so that every time I open my laptop, I am reminded of where I want to be a few years down the road. To the members in the picture, I just want a chance to say thank you for inspiring me.